DETROIT, Mich. - The 2008 Chevrolet Silverado and GMC Sierra 1500 Series pickup trucks have received the federal government's highest side-impact crash rating - five stars - making Silverado and Sierra the industry's only full-size pickups to earn this top rating. Silverado and Sierra 1500 Series Regular Cab, Extended Cab and Crew Cab models all received the highest possible side-impact rating for models tested with and without available head curtain side-impact air bags. 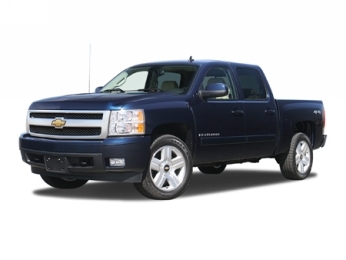 The Silverado and Sierra previously received the federal government's highest frontal crash test rating of five stars. Government star ratings are part of the National Highway Traffic Safety Administration's (NHTSA's) New Car Assessment Program (www.safercar.gov). "Customers continue to rank safety higher on their lists for new vehicle purchases and that helped us make safety before, during, and after a crash among our chief priorities when we redesigned the all-new Silverado and Sierra pickups for the 2007 model year," said Gary A. White, GM vice president and vehicle line executive for full-size trucks. "The industry-leading safety attributes of these pickups add to their well-deserved and longstanding reputation for dependability and durability, the hallmarks of a great pickup truck." Silverado and Sierra deliver 360 degrees of crash protection through a stronger frame and body structure as well as industry- and segment-leading technology. They are also designed to provide increased compatibility with other vehicles. Features include segment-first StabiliTrak electronic stability control with rollover mitigation technology; available roof-mounted rollover-capable head curtain side air bags, which are integrated into strengthened chassis and body structures to provide excellent passenger protection; and segment-first safety belt pretensioners that activate during a rear impact. The rollover-capable head curtain side air bags are available on Silverado LT and LTZ and Sierra SLE and SLT models; they are standard on Sierra Denali models.